The HERCULES Series delivers the most durable wheel wash system on the market and is ideal for permanent applications. 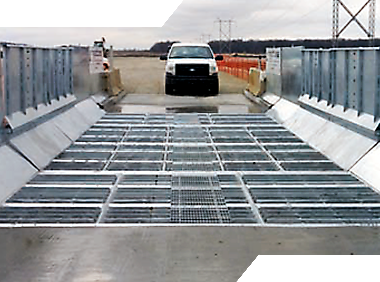 Assembled on site, this system consists of a concrete substructure and center sections for the wash platform and concrete stem walls, coupled with galvanized steel side walls. Typically, the HERCULES Series is installed with a three compartment concrete water recycling and solid separation tank. The tank is designed with one sloped compartment to allow solids to be removed with a front end loader. 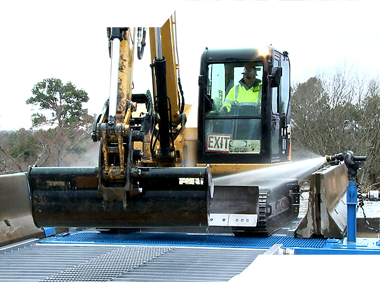 Tank can also be designed to have solids removed with a backhoe or a scraper conveyor. • For use on all types of wheeled equipment - wheel loaders, haulers, scapers, etc.